Chevy revealed their Aero Kit for the 2015 IndyCar season on Tuesday at IndyCar media day. The release saw some interesting design and technical features on the car. In an earlier post, I talked about and gave an overview of the new features on the car compared to the Dallara chassis the teams were running last year. This time, we’ll be taking a look at a specific feature of the Aero Kit that is new to the IndyCar series, grilled endplates. Endplates are vertical elements attached to the rear and front wings of the cars on either side (see image above). For this feature, we’ll just be taking a look at the specific function and implementation of endplates on the rear wing, and using the Chevy Aero Kit as our reference. When the Honda Aero Kit is released, a new article may be written depending on how different the designs really are. The main uses of the endplates are to decrease drag and manage how the air flows around the wing element. Endplates work like winglets do on a plane. The endplates also help to manage how the air is moved around the wing and hitting the other elements. Teams can better manage down-force levels and achieve the proper performance from the car with endplates. It gives them another mechanical device besides the wing itself to tinker with. They help the car cope with the airflow over the wing and direct its path. 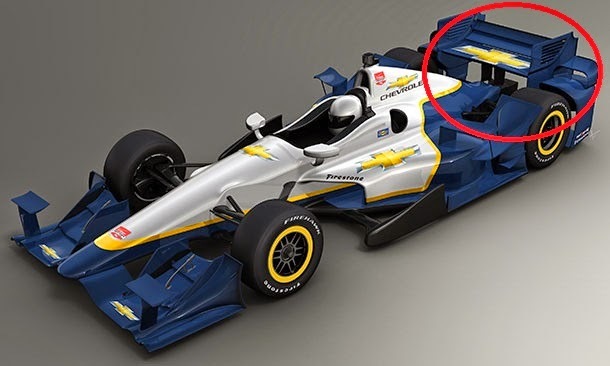 Depending on how much leeway IndyCar gives to the teams in terms of modifying the endplates and wings, they could be changed every race as a part of the setup to achieve the proper down-force. It will also be interesting to see how Chevy changes the endplates for oval courses as compared to the road setup. One thing you can be sure to see is a change in the size and number of “grills” on the actual endplate. IndyCar’s endplate (2013) vs F1’s. Note the grills on the F1 car. As you can see from the image above, IndyCar has always had smooth endplates with no grills (also known as slots) on them. On the contrary, Formula One has been seeing grills on the cars’ endplates for many years now. The grills play a vital role in equalizing the pressure above and below the wing. Without the slots, the two pressure zones would collide and run off of the wing, creating turbulence and increased drag on the car. The slots help to equalize and bring the two different pressures (high and low) together before they exit off of the rear of the wing tips. Air pressure moves towards the outside of endplates. The high pressure air traveling over the wing moves toward the slots and the edge of the car due to the lower pressure air that is on the outside of the endplates (just as gas diffuses in a room, moving outward from the source). This creates a gradual reduction in the pressure and smoother airflow when it comes off of the wing. As I said before, it is possible to change the both the size and number of slots on the endplate, and I suspect Chevy will make those changes with the speedway kit. If the actual size of the rear wing changes, more slots would be needed to achieve the same affect. The greater the area of the wing, the greater the pressure difference between the inside and the outside of the wing. The more grills in the wing, the more air is diffused out and less pressure is left on the top of the wing, the less down-force the car has. So, at a speedway like Indianapolis, the Aero Kit may have more slots in it to reduce down-force in order to gain more speed. This assumes the speedway Aero Kit has a rear wing of the same dimensions as the road/short oval one does. If the wing is smaller to start with, then teams won’t need the extra slots because the wing itself will do the job of reducing down-force just by taking up less area. If you have any questions on endplates and the slots on them, or want to know more about another feature of Chevy’s Aero Kit, let me know in the comments below or on Twitter!